(CNN) -- India's hopes of qualifying for the Champions Trophy semifinals hang by a thread after their game against Australia was abandoned due to heavy rain at Centurion on Monday. Heavy rain at Centurion meant India's hopes of reaching the Champions Trophy semis now appear slim. Only 42.3 overs were possible in the Group A clash with Ricky Ponting's side amassing 234 for four thanks largely to half centuries from Tim Paine (56), Michael Hussey (67) and the captain himself, who made 65. 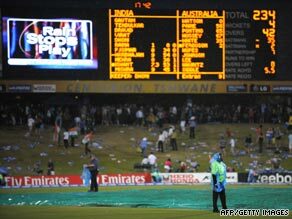 But a violent thunderstorm then struck towards the end of the innings, flooding large parts of the outfield and forcing umpires Billy Bowden and Ian Gould to declare the match a no-result. It means that both teams were awarded a point each with Australia moving to three in the group, one behind leaders Pakistan, while India (one) and West Indies (none) prop up the table. It leaves India with a tall order to progress to the last four with one game remaining. India will first need to defeat West Indies on Wednesday while hoping Australia lose to Pakistan, who have qualified as a result of Monday's result. MS Dhoni's side's hopes, however, are complicated by a vastly inferior run rate with Australia (+1.000) some way ahead of India (-1.080).